Located in the heart of Peace River, River City Cinema (formerly Cinema 72) has been refurbished with a newly designed lobby and brand new state of the art washrooms. We have expanded to 4 screens with comfortable seating and are wheel chair accessible in three auditoriums. 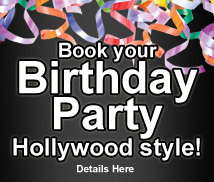 We now have a Party Room available for Birthday Parties and Meetings. The toll-free movie information line allows out of town customers to check movie information free. Matinees are held every Sunday afternoon and on selected days when children's pictures are playing. Birthday parties are welcome and the special family admission price allows large families to attend at a bargain price any time. Tuesday is discount night, with all seats at $6. We are always planning special treats and deals for our valued customers! They range from Free Morning Movies, Group Discounts, Private Screenings (for individuals or corporations), or Fun Movie Contests and prizes galore! Please check back later for the latest specials at your local theatre.